Single family beach home totally renovated. Ranch style property including hardwood floors, lots of granite, tile, and stainless steel appliances. Huge outdoor deck and outdoor shower. Nice size great room for gathering together. Best 5 bedroom value in Dewey! Located in the heart of town. Parking for 4+ cars. Sleeping for up to 12 people. Beds: 2 queens, 3 twins, 2 fulls (1 extra twin mattress). 3 Full Bathrooms. This is a one block walk to the beach, a few blocks to the bay ... and just a short walk to Rehoboth/boardwalk or take the jolly trolley which runs every few minutes. First class top quality house. Booking fast; email or call to book your week! Our family loved this house. It was our second year and we hope to return in the future. The house is in a great location -- close to beach, restaurants, and play ground -- a particular favorite of our toddler grandchildren. It is very well equipped, including beach toys and chairs, comfortable, and spacious. It was our family's 1st visit to Dewey Beach, DE and we all agreed it will not be our last. The house was everything we expected it to be. We were a family of 11 and we had just enough room to still be comfortable. There is a hugh wrap around porch that we enjoyed both mornings and evenings. The home owner had a lot of beach chairs and toys we could enjoy at the beach. The beach was very easy to get to and lifeguards were right on the beach (with small kids it was nice). Justin, homeowner was very reachable to answer any questions. We would definitely rent this property again. The house was very nice, nice kitchen (did a lot cooking in it) lots of pots and pans and plates. We spent a lot of time playing games and cards around a large dining room table. We just had a great time there. The layout of the house was perfect to accommodate our family of 6 adults and 4 boys ages 9, 11, 14,and 16 months. Everything was in great working condition both inside and out. Plenty of beach gear available to use (chairs, umbrellas, boogie boards, toys etc. along with 3 bikes to ride). Everyone loved the outside shower. The only negative comments I would make are: 1) some of the beds did not even have a comforter, 2) the pillows were terrible, and 3) there is just too much junk being left behind by renters accumulating in all of the kitchen cabinets and drawers. This house was ideal for our vacation. 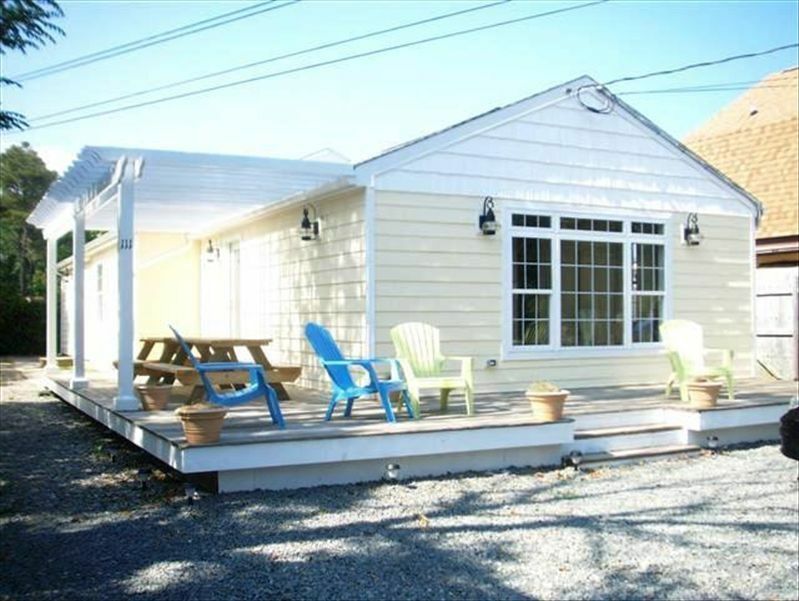 The location is great, as it is only a block from the beach and very close to the Dewey Beach restaurants. The house is very nice, and it was comfortable for our family. There is plenty of space with the 5 bedrooms, large open living room & kitchen, and 3 full indoor bathrooms plus an outdoor shower. The driveway also allows for multiple cars to park. There is a gas grill and picnic tables which made outdoor BBQs a lot of fun. We also greatly appreciated the community items that were at the house for us to share including bikes, beach chairs, boogie boards, beach toys for the kids, and a beach cart. Justin, the owner, was very responsive and answered all of our questions in a timely manner. Overall, we could not have asked for anything more from our vacation home, and we will be reserving it again for our next trip to Dewey Beach. Can't wait to get back to Dewey Beach! This was my first time in Dewey Beach and I didn't know what to expect. Justin's house offered everything I love in a beach rental: walk to beach (1 block), walk to restaurants and shops. It was clean and comfortable for my family. We are already talking about booking another week in this house in 2017!